Why do I go to Ireland? It is a question I was soon asking after arriving on the Emerald Isle. The country is inordinately expensive, whether one wants to find a hotel or B&B, buy a meal or a pint, use the infrequent and slow public transport systems or just enter a football ground. It almost always rains at some stage during a weekend trip, and the football itself is not very good. And then, to add to the difficulties, there is the uncertainty about the fixture list. Part of the weekend trip I had planned featured a match between Shamrock Rovers and Sligo Rovers, at the Tallaght Stadium. This being Shamrock’s first season here, after a number of years sharing other Dublin grounds. According to the fixture list seen when I booked my ticket, about two weeks before the trip, the game was scheduled for the Saturday. Having decided to make the trip, I was then hoping Sligo would meet early defeat in the Europa League qualification, because if they played in that on the Thursday, surely their league game would be postponed until the Sunday. This is at least was not a problem  Sligo went out at the first hurdle. My travelling companion, Paul had found a cheapish hotel almost adjacent to the Tallaght stadium, and on booked this six days before we travelled. Later the same day, we found that the match was switched from Saturday to Friday! I then phoned Shamrock, confirmed they had switched the fixture and actually booked two match tickets, while Paul changed the hotel reservation. Based on this, I made plans for a long bus trip to Finn Harps on the Saturday, while Paul, who had been to Finn was heading to Longford. So all fine until I arrived in Dublin and picked up the local paper. 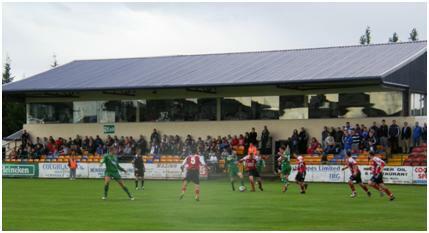 On the day before the match was due to be played, the local council had decided that Shamrock could not use the Tallaght stadium due to health and safety issues as work was being carried out to increase the capacity for two prestige friendly games (one of which had already been played). So the date returned to Saturday, and the venue was changed as well. Fortunately, neither club not hotel complained about cancelling the reservations. So, Shamrock was taken out of the equation, and we made our way down to our alternative fixture at Wexford (indeed the one we would have chosen for the Friday, had Shamrock played on Saturday). It takes almost 2½ hours to get down from Dublin to Wexford by train  a slow journey at this is under 90 miles. The four car diesel unit used demonstrates that the Irish Railway system is no better than the English at matching demand to train size. Not only was this one full to standing for over half the distance, but the one we returned on the following morning had far less custom, but six cars. Wexford is a pleasant enough town, but does not have a anything really special to promote it. We took up residence in the closest B&B to the railway station despite the extortionate 90 for a twin room. We at least persuaded them to put on breakfast before the first train of the morning. One might have thought that a B&B close by the railway station was used to getting customers who wanted breakfast in time for the early train (which was 8 O’clock), but apparently this is not the case. For the record, the room was comfortable, but not special; and the breakfast was good. Wexford Youths are newcomers to the League of Ireland, having joined in 2007. They have grown out of the successful County Wexford Youth team, and the five stars shown above the badge on players shirts and the programme cover all refer to national youth titles won (and all within the last decade). The club owes its progress to local businessman Joseph Wallace. The club plays a quite large site at Ferrycarrig, about 5 miles north of Wexford, (no public transport, about 11 by taxi). Access is quite confusing  the ground is next to the main road, but there is no entry at this point. Instead, a one way system down small country lanes in instituted on match days. At the ground are two full size pitches, and with two five a side pitches further on. Two buildings separate the main pitches  one is still under construction, and appears to be a sports hall, the other holds dressing rooms, bar and offices for the club. Most of the main pitch surrounds are flat, with a single stand, apparently built from meccano, and with a tarpaulin type roof. Dotted at intervals around the ground, are converted portacabins or containers providing facilities such as lavatories, ticket office and tea bar. All of the facilities have been paid for by Wallace, who is club chairman. A permanent stand is apparently due soon, and as one of Wallace’s companies is in development, I assume he knows how to get this. His son is manager of the team. It is interesting to reading the programme notes that at Wexford, it is not the senior team that takes precedence, but the youth teams, and in particular the under 18 team that has picked up the trophies. The notes said that in particular, the under-20 team would get squeezed by demands from the under 18s and seniors  but this appeared to be disingenuous. Despite the programme claim that most of the senior side also qualifies as under 20, no starting player was less than 20 years old (2 of the subs were 18, and a couple of the 20 year olds may still qualify if the under 20s have a spring qualifying deadline). The programme referred to was a 16 page A5 affair, selling for the princely sum of 3. Admission to any part of the ground was 10. And so, to the game. The visiting club were University College of Dublin (UCD) currently third placed in the league compared to Wexford’s fifth. The UCD team are mainly students, although it also acquires a few additional hands and they started out as much the stronger of the two teams. It was no surprise when they went into the lead after just 18 minutes, but disappointing that they could not add to this in the rest of the game. A lot of football in this division relies on an uneven division between attackers and midfielders trying to show off a bit, (but lacking the real ability to make a telling pass or hit the target consistently), and well organised defensives. Many of the attacks broke down simply because the player on the ball was not looking for the simple ball, but seemed to believe it was a requirement to turn the defender before passing. 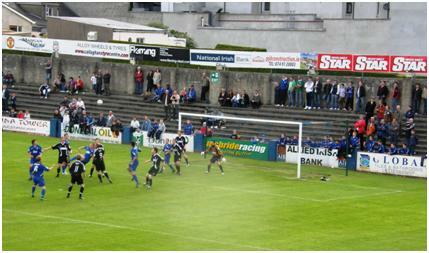 At both Wexford, and Finn Harps the following day, the opening goal was partly helped by a fortunate bounce or block. Wexford rallied near the end, and attacked enough to feel they deserved an equaliser  but I felt that this would have been unfair on the visiting club, and in particular their best player; Evan McMillan, a 22 year old centre half who also still turns out for student teams, and who won almost every ball put into the box in the air. Getting away from the ground, we were lucky enough that by just asking drivers leaving, we easily found someone heading back to Wexford and willing to give a lift  otherwise the alternative would have been to phone for another taxi. Plenty of time for a couple more pints of Guinness (average 4 per pint) before turning in. So, without the easy option in Dublin (unless I wanted to return to Tolka Park), it was going to be a long day of travelling on the Saturday. The train took as away from Wexford at a few minutes past 8, giving me best part of an hour to arrange my transfer to a coach (the bus station being a five minute walk). Irish bus does a good selection of radial routes from Dublin, serving most of the country. The coaches are comfortable and not cramped, prices are a little less than the railways. Generally, I am told the timetables are kept to, but I was not lucky, and major traffic jams on the way into two of the towns en route meant my bus was 30 minutes late. No here is a problem  Finn Harps play in a small town called Ballybofey, which is not on a direct route from Dublin, and the connecting buses run only every two hours. Hardly any connection time is allowed, and they don’t wait. So I had 90 minutes to wait when changing. Fortunately, the bus stop was adjacent to the bar, and I could indulge myself in a Guinness while waiting. So, by the time I arrived in Ballybofey, I had been travelling for over 10 hours. The main street was full of people in football colours drinking before the game. This, of course was not the game I was there to watch, but a qualifying round of the all Ireland Gaelic Football Competition, in which Donegal, (the Irish county including Ballybofey) were playing neighbouring Derry. I had booked into a really nice hotel, spacious and comfortable room, good breakfast, and not much more than I paid to share in B&B on the nights before and after. I noticed from the web site that rooms come even cheaper in mid week, and I would recommend Jackson’s hotel in Ballybofey to anyone passing the area during the week. Not much to do in the town, unless there is football or Gaelic sport on, but of course the town does have an appropriate number of pubs and restaurants. The Gaelic ground is just north of the main street, while the Harps Stadium is a few yards south, behind the shopping centres. Despite this being an old and interesting ground, it will soon be replaced by a new stadium in the neighbouring village of Stranorlar, (the Finn river marking the boundary between the two). The existing ground seems more than sufficient for the crowds that Finn get, even if they could return to the Premier Division, so naturally I was intrigued as to why they wanted to move. The answer is there is only one cramped building serving as dressing rooms and offices  no bar or other facilities, and pitch side refreshments served from temporary huts. There would be room to improve the current ground  but developers would prefer to extend the shopping centre and move the club elsewhere. The ground is three sides  there is no spectator accommodation at the far end (away from the ground), while the cover is in the form of a barrel roofed stand filling most of the side close to the road. At one end some new seats have been installed on a standard scaffolding base, while the rest is low rise terracing. I am guessing there was once something taller, but this has been knocked down. Meanwhile I was asking about the clash of fixtures with the Gaelic. “You do ask difficult questions”, the secretary responds  before telling me that the League of Ireland do not allow fixtures to be changed at less than two weeks notice, (a strange statement considering the Shamrock game had been switched twice in the last five days). The GAA, meanwhile, makes its fixtures only a week in advance, a necessity of a knock out competition with matches every week. With the strength of having much larger crowds than the association game can muster; the GAA keeps its own counsel, and only needs to discuss its schedule with the TV company. A few people did walk into the game last on after the GAA game had finished  something I had seen before when a game at Tolka Park in Dublin started while a GAA game was being played at nearby Croke Park. If the GAA match had considered kicking off an hour earlier, then many more people would have been able to double up. As for the game, not much different to the night before. Defences were generally organised, whereas the attackers continually failed to make anything of the possession they had. Finn were the better team and took advantage when a clearance went back out to the winger  one pass and a good finish. In the second half, Athlone Town managed to level the scores. Again it was a good finish, and again there was little teamwork involved. With the first bus out of Ballybofey being at 12.25 the next day, I had time for a good night’s sleep. The timing became critical as I had only a few minutes to make a change of buses. Even with all the transport going smoothly, (and it did)  I only arrived in Newbridge les than an hour before kick-off. Fortunately, Paul, with the shorter journey had booked into our B&B and met me at the station. The ground, is in Station Road and all we had to do was cross the railway to get there. The ground actually belongs to Newbridge Town, of the Leinster Senior League, rather than Kildare County, and all the signs show the Newbridge name. On the side where we entered, there are two sections of open seats, made up on scaffolding. On a blustery and wet evening, not many people choose these seats, as those on the other side were protected by the club house roof. Again just five rows of low seating. The clubhouse itself is two storey, and above the seating there is a good area that can be used as a VIP viewing area, but it does not appear the club has managed to sell this idea. The referee’s dressing room was also upstairs. Downstairs were the other dressing rooms and a small bar  where care was needed due to exposed wiring just by some seats. The game was no better than any of the others. The visitors, Limerick were on top throughout, but were quite incompetent and it did not take long before we had concluded a no score draw would occur. Kildare are about the worst team in the League, and would have been relegated last season, if Cobh Ramblers had not been thrown out of the league. Having been reprieved once, they have won only once this season, (away to Mervue, the team that would have replaced them), and this was their second home draw. Naturally, they are the only candidates for bottom place again  but relegation depends on a first team finishing in the top three at least one group of the A championship (the third division, split into two groups of 9, but including 13 reserve teams). It appears Salthill Devon may be the challenger  play offs will take place at the end of the season. Note the small group of supporters to the right (as we see it) of the entrance way are from visiting club Limerick. They were very vocal, but could not spur the team on to actually score. The Irish League changed to a summer season in 2003, and it has achieved its first objective in doing so  on the UEFA rankings used to determine numbers for club competitions, Ireland has risen about 10 places, from around 40th ten years ago. By comparison, Northern Ireland and Wales are still in the 40s. According to the web site, European Football Statistics, this has happened without much noticeable effect on the crowds attending the games. The season by season averages for the Premier Division are still around 1500, with Division One getting something less than half that. Now in its summer season, Irish football plays second fiddle to the Gaelic games, while when playing the winter season; there were always more people crossing the water to see Liverpool, Manchester United and Celtic than the total watching League of Ireland. With these figures, the finances of Irish football are always on a knife edge. The cost of living in Ireland is high  most things are more expensive there than in the UK, and the recession has hit the Celtic Tiger hard. While Ireland is still a popular destination for English and Scottish clubs in pre-season, the really big crowd pullers, such as Real Madrid do not have this as a regular visiting spot. 10,000 spectators at Tallaght thanks to the addition of temporary seats is not normally enough of a crowd to pull in the giants  although once Lansdowne Road has been rebuilt, the prospect of filling this may generate the receipts guarantees required. And while Ireland have improved their ratings with UEFA, it has not yet been enough to get the clubs into group contention in either the Champions League, the Europa League or its predecessor, the UEFA Cup. While I was there, some of the local papers had realised that Bohemians v Salzburg in the Champions League was the big game of the week, even if they still refused to give it the same sort of coverage as the glamour boys of Real Madrid, (the opposition was generally inconsequential and hardly mentioned). Bohs had already drawn in Salzburg, and if they could win this match, they would have to play Dinamo Zagreb  not exactly the top team in Europe. This is where the new method of keeping champions and non-champions apart can help. On seeding, most of the clubs winning second qualifying games in the old days would find themselves up against runners-up from nations in Europe’s top 15  now they have to play Champions, but against teams from much poorer leagues. Losers in the Champions League third qualifying round get a second try in the Europa League (but those who fall earlier do not), while the fourth and final qualifying round is a selector  winners go into the Champions League group stage, while losers play in the Europa League groups. Having seen Salzburg in May, I thought they should be too good for an Irish team, but Salzburg have hardly played since then, while the Irish season is in full swing, and a 1-1 draw in Austria seemed to swing the tie towards the Irish  but as it turned out, Salzburg got a late goal in a defensive match in Dublin and now face Dinamo Zagreb (another team I saw in May  I am again predicting a Salzburg win). Still, it has not been all gloom for the Irish in Europe. Bohemians may be out, and Sligo lost earlier, but the two Europa League contenders still in the competition both went through, following 1-1 draws in the first legs with single goal victories. St. Patricks managed this away to Valetta in Malta, while Derry City played Skonto Riga. St Patricks now take on the Russian team, Krylia Sovetov Samara while Derry will play CSKA Sofia. With another round to go, even if they win these (and the odds do not favour the Irish), group stage football still looks unlikely, but Ireland will at least hold its rating in Europe. Go No More a Wandering? The close season started with dire predictions for clubs getting into financial troubles, with some commentators promising a domino effect of clubs going into administration or even liquidation and then those holding the debts of the others getting into a panic. While this has not happened, there have been a number of scares; in the league Darlington and Stockport County went into administration at the end of last season, losing 10 points then, while Southampton will have their deduction at the start of the new season following their prolonged troubles. Farsley Celtic in the Conference also start on -10, having survived a move to have them removed from the league for going into administration after the league’s AGM. We have lost a few clubs from non-League football, to be replaced by new clubs in lower divisions, Gresley Rovers, Southern League champions in 1997 (when runners-up Cheltenham were promoted) dropped out of the Northern Premier League, to be replaced by Gresley FC in the East Midlands Counties League; Fisher Athletic have become Fisher FC in the Kent League, while possibly the worst felt of all is Darwen  once a league club and one of the first professional clubs in the country, who are replaced by AFC Darwen in the West Lancashire League. All of these, at least appear to have kept their old grounds and continue to exist in a new way. Team Bath, Newcastle Blue Star, Prudhoe Town, Sunderland Nissan and Oldbury United all appear to have been wiped off the football map this summer. As bad as this cull may be, it is far from the apocalypse that I had seen predicted in some quarters. There is a massive amount of debt held by football clubs at league and senior non-League level, but on the whole those that hold the debt are not about to call it in, knowing that few clubs have assets to pay off all their debt, and so any attempt to claim it back at the moment will end in some monies being lost. The biggest threats to the running of football come from the tax authorities, who are beginning to blanche at the fact that many clubs feel that a late (or non-)payment of VAT or employees NI is a way around cash flow problems, or individuals who may once have appeared to be the knights in shining armour to a troubled club, but later reveal themselves as a more frightening manifestation than the one they vanquished. Many come in as saviours, putting in much needed finance to stave off a crisis, and at the time agree with the ideals of the fans, such as having trust representative’s on the board; then over a period of time they get more and more involved, adding a loan here, or increasing their investment into the club, building up their stock. But, if the truth is to be told, there are few true benefactors in this world, who are willing to pump millions into a football club with no chance of ever seeing a return. Everyone has a bottom line  some realise that they cannot continue to finance a club that will continue to be a money pit, and make a gracious and generous exit, like Max Griggs at Rushden & Diamonds; some sell off the club and try to recover their loan notes in that way and others have a vision for how the club can be turned into a profitable enterprise, and run with that dream regardless of how their ideas are thought of by the club’s fans. The movement of Wimbledon FC to Milton Keynes can be seen in this light  the opinions of the Wimbledon fans could be completely ignored, because once the club had moved, it was looking for a new customer base, well removed from its original fan base. The original move of Wimbledon was a failure, of course  it was supposed to be the saving of the club, but in fact they went into administration soon afterwards, writing off most of the debts of the old club, (the same happened at their Scottish equivalent, Livingston, soon after they gave up being Meadowbank and left Edinburgh). Since coming out of CVA, though, MK Dons have been quietly building up a local fan base and threatening to get promoted to the Championship. The real, and as yet unreached milestone would be to post an annual profit. For clubs that do not make the headlines, the assumption is that there is good governance behind the scenes, and that even if they make losses, the figures are manageable, and the club is not at risk. This is really not the case, as most often the situation at a club is hidden until the crisis occurs. It has also been suggested that clubs ran by fans, through Football Trusts might be an answer, and two football league clubs, (Notts County and Exeter) are under supporters control  but the experiment has failed elsewhere, with AFC Bournemouth, Brentford and Rushden all dropping this to allow in outside investment. But, until 2004 one club did not need a Supporters Trust to obtain supporters control, as one club was still controlled by its supporters, with the directors answerable to them. This club was Wycombe Wanderers. As a supporters’ run club, Wycombe progressed from cramped ground in the town centre, with a notorious 11 foot slope, and average crowds in the Isthmian League of around 600, to a League-1 club playing in a new stadium, with a turnover approaching £5 million a year, and reaching the FA Cup semi-final. But things were not as smooth as may be thought – the money from the FA Cup run was spent wisely, on the training ground and improvements at Adams Park, but even with the supporters overseeing the club, debts were beginning to become sizable. By the end of 2002-3, the club was £2.2 million in debt, although 20% of this was interest free, mainly from the directors. For a club that owns its own stadium, and has some very good social facilities, this type of debt is not a major problem, so long as some action can be taken to stop the £½ million a year in losses. Of course, stopping losses is not easy  prices may go up, playing budgets down, and costs need to be cut in other areas  all of which would prove unpopular with the fans. These debts, of course, were being incurred despite the additional income to the club from sharing the pitch with the Wasps Rugby Union club since 2002. In 2004, a new structure was pushed through, despite the unease of many fans. The club became a limited company, but no individual would have the right to own more than 25% of the shares. Two members of the newly formed supporters trust would serve on the board, and the “founders” group of 500 supporters would have a degree of control  no change could be made to this constitution, nor could the ground by sold, or the club relocated without a majority vote by this group, (in order to get the 2004 changes passed, the group had to vote 75% in favour). Entering the frame at this point is Steve Hayes, former co-owner of an internet loans company, who bought 25% of the shares for £250,000, and became the new club chairman. Hayes later took control of the tenants, Wasps in two sweeps, buying 11.6% of the shares in 2007, and then taking over the whole club in 2008. Last summer, the story moved on a stage further, with plans revealed to move out of Adams Park (aka Causeway Stadium), and to build a new ground  the preferred site being the current Wycombe Air Park where the lease runs out in 2014. From a Wycombe Wanderers point of view, this is not a fantastic option  a new stadium holding up to 20,000 is too large for a club that could only once get close to its 10,000 capacity in a promotion stadium (the second biggest league crowd was 6300). But for Wasps, it is a priority with the Rugby authorities likely to demand a 15,000 minimum size in future. Now, this summer, comes the real blow to supporters control at Wycombe. They should have seen it coming. Since coming to the club, it turns out that Steve Hayes has put in £6.93 million in loans  representing a loss of around £1 million per season over the last five years. As far as I know, this is all or most of the debt currently at the club, but it still shows a serious lack of constraint by the club’s directors and in particular the chairman himself. It appears that few clubs in the lower divisions of the football league trade at a profit, but losses of around £1 million per season appear to be exceptional, especially when one considers, that as a result of the fact they share their stadium with Wasps, Wycombe are picking up a reported £600,000 per annum in rent and other benefits, (more than double, for example, the amount that Cheltenham were hoping to get by loaning their stadium to Bristol Rovers for a season). The supporters’ representatives on the board may have protested against the losses, but they have not been able to change it. Hayes, meanwhile may have been financing the club, but most (or all) the money he put in was in the forms of loans, not gifts, and therefore would at some stage come up for repayment. Now that the repayment is due, the club, and in particularly the supporter representatives on the board, find themselves with the choice of submitting the club wholesale to the man responsible for creating the mess, or going into administration, (and possibly liquidation). Hayes made it clear that he was not going to finance the club further if he did not get his way, and although some of the support still voted to rid themselves of the man; that option seems more like a suicide pact than anything else. Under the old regime, the supporters had a veto over the selling of Adams Park and relocating, but surely this veto would be null and void had the club found its way to administration, with the main creditor almost certainly being the person making the best offer for the ground itself. If the positions were reversed, and Wycombe if found themselves having to pay rent to play on their ground in addition to a lack of continued financial indulgence from Mr. Hayes, it would be very difficult to maintain the club at this level. That Mr. Hayes made some small concessions to the supporters’ organisation may show that he is not completely the ogre some portray him as, and that he does still support the club  within the constraints of his own vision. In exchange for taking on the other 75% of club shares, Hayes has written off around £3 million of the debt, (curiously, I see no mention of the owner of the shares he has just obtained, gaining any recompense themselves). He agreed the trust would have first option if he ever came to sell the shares, (but of course, not specifying the price), and more generously  but quite likely unenforceable  he has promised a £1.5 million donation to the trust to restart the club should he take it into liquidation. Finally he has agreed that Wycombe stay at Adams Park until a new ground within a five mile radius can be found. The Air Park, is of course within that radius. On the negative side, he may claim back the remaining £4 of loans, (and any others added in the future), and walk away if the new ground has not been agreed by 2014. In all, despite these promises, the club is now completely in the hands of Mr. Hayes and its future, including funding and the new stadium depends on his vision. The last vestiges of supporter control have gone. But one has to ask oneself, if Wycombe Wanderers with all its advantages  ownership of the stadium, income from the Rugby club, good social facilities, and attendance that are better than many of their close rivals  fall so far short of balancing their books, then what chance do their league rivals have. While the FA and the Football League still stand by, practically inviting clubs to build up debt and then take the hit of going into administration, (except under this seasons new rule, not too much debt to the taxman please, as he is threatening to spoil the party), there is little chance of sanity hitting Football League finances; it is certain that more clubs will go into administration, and surely soon, League clubs will fold. You are currently browsing the Football Shaped blog archives for July, 2009.